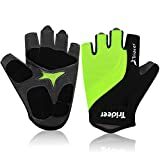 All-Purpose gloves: Suitable for Biking/Bike/Cycling, crossfit & general workouts, bodybuilding, exercise, fitness, sporting, and gym training.,etc. Designed specifically to get the perfect fit for men/women(ladies/female)/trainers/athletes. Highest quality gloves in the market come in 4 Sizes: small, medium, large and X large. Pls measure the circumference of your hands (as picture) by measuring tape and compare with the chart to know the size of your gloves.